As we head into warmer months and are getting in that summer state of mind, I've teamed up with Tiaras Boutique to bring you a series of Summer Style Staples for mommas on-the-go featuring five summer looks to add to your wardrobe! I'll show you how to style each must-have piece, along with providing other styling inspiration and options. Make sure to stop in Tiaras (or visit their website), where you can shop the same exact pieces for yourself...and boom, your style will be ready to go for summer!!!! 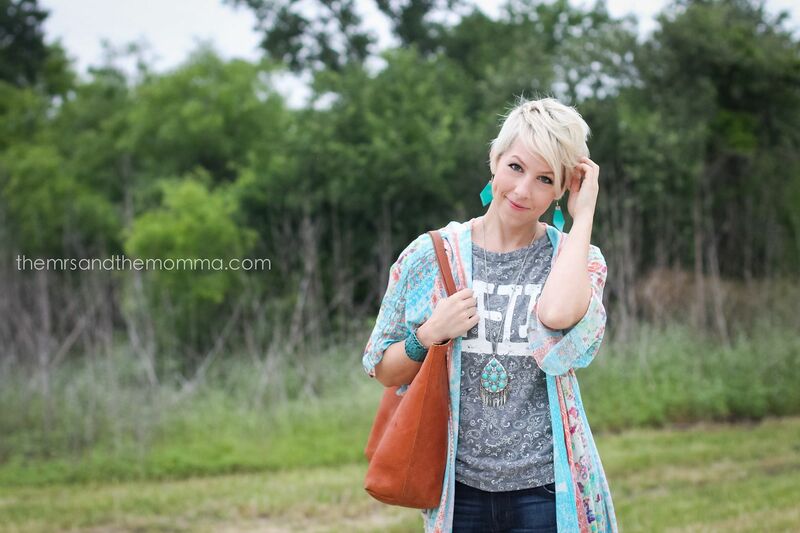 Our first Summer Style Staple is none other than the popular kimono! I've blogged about my love for this fashionable addition to any wardrobe several times...and do you know what??? They have major staying power, which means you'll get tons of wear from one...or two or three. A kimono not only gives a chic vibe to an ordinary look (without it, my outfit above would have been a boring tee and jeans), but also is the perfect light summer layer! 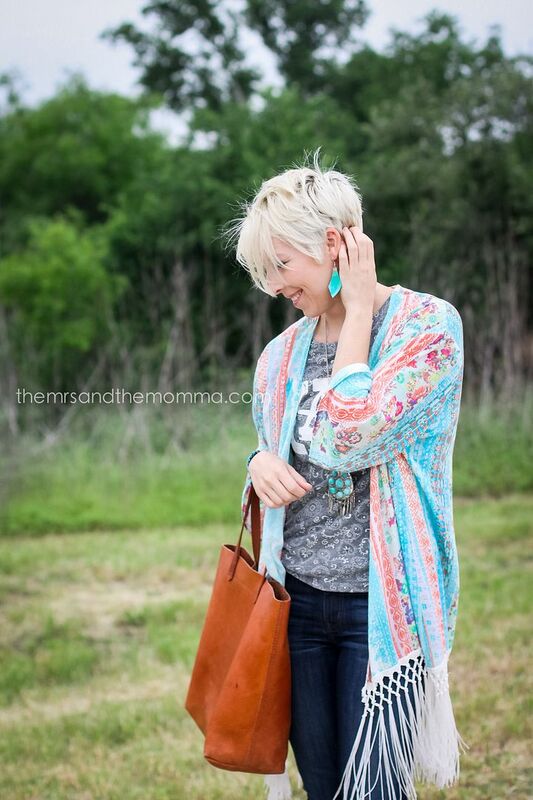 I can't stress enough to PLEASE add a kimono to your closet today! You'll find yourself wearing it more than you ever thought you would...I promise! >>> Pair with a graphic tee and jeans/shorts (as shown) for a simple, yet put-together look. >>> Wear as a swim coverup. >>> Wear with leggings, a loose fitting shirt, and wedges for a laid-back vibe. >>> Pair with a jumpsuit or romper for added coverage. 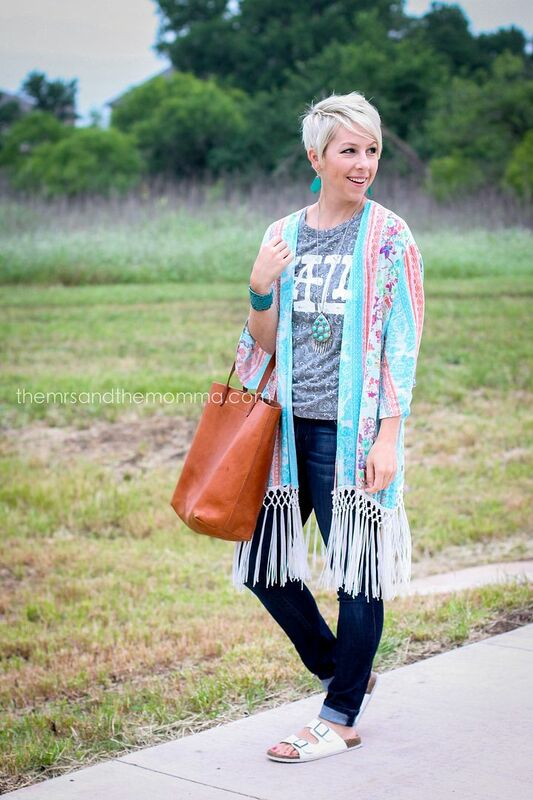 >>> Because kimonos are usually long, pair it with a long pendant necklace to streamline and elongate the look. Also, bring out your big earrings and chunky bracelets to complete the outfit. >>> Don't be afraid to mix patterns. Most kimonos are patterned, allowing endless possibilities for other patterns to mix, such as stripes, polka-dots, etc. >>> For a sleek, dressier look, go monochromatic (try out all white or black) with your top and bottom underneath...letting the kimono be the star of the show. *** Stay posted for what's next up in the Summer Style Series...here's a hint: easy, breezy, comfortable bottoms! This is a great look. I have about 4 kimonos in my closet thus far and am always tempted to add more. I like the idea of pairing with a graphic tee. Why hadn't I thought of this? !